LIVINGSTON COUNTY — Although bats are very helpful to humans and the environment by consuming insect pests, the Department of Health says that any bats found in the home should be captured and tested for rabies. According to a press release from Livingston County Department of Health, bats are the most common source of human rabies in the United States. Bats can spread rabies to people and animals by biting, and bats’ teeth are so small that humans could get bite from one and may not even notice.  Do not touch the bat with your bare hands. Put on leather work gloves.  Get a small box or coffee can, a piece of cardboard and tape.  Wait for the bat to land.  Approach the bat slowly, and while wearing the gloves, place the box or coffee can over it.  Slide the cardboard under the box or can to trap the bat.  Tape the cardboard to the can or box opening so the bat cannot escape.  Punch small holes in the cardboard allowing the bat to breathe.  Leave the bat in the container. Then take the container outside and call the Livingston County Department of Health at (585) 243-7280, or the Livingston County Sheriff’s Department at (585) 243-7100 after hours.  Do not release the bat. The bat should be tested for rabies to determine the need for rabies treatment. “Its crucial to capture the bats especially when someone is sleeping, they could get bite and not even know it,” Grove. To prevent bats from entering your home, the Department of Health says it’s best to contact an animal-control or wildlife conservation agency for assistance with ‘bat-proofing’ your home. However, if you choose to do it yourself, ‘bat-proofing’ can be done by caulking any holes that are larger than a quarter inch, closing all doors to the outside tightly, using chimney covers, window screens, and draft guards beneath doors to attics. 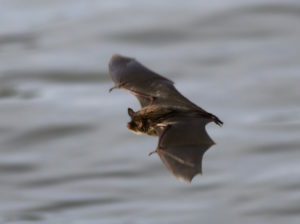 Bats can even enter homes through loose shingles, siding, or open vents. If you have pets, it is important to keep them up to date with their rabies vaccinations to prevent exposure. If there are any questions or concerns please contact the Livingston County Department of Health at (585)243- 7280 or visit our website at www.livingstoncounty.us/doh.htm.